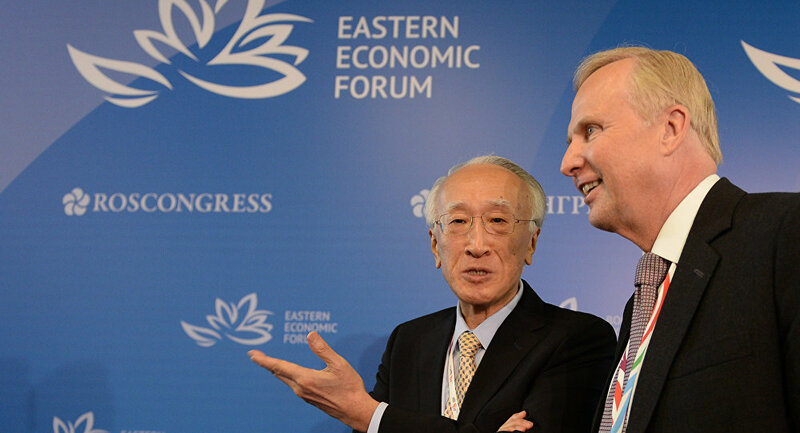 Saturday saw the wrap-up of the two-day Eastern Economic Forum in Russia’s Far East. The event, which was held on Russky Island near the city of Vladivostok gathered 3,500 participants from 56 countries, including China, Japan, South Korea, India, Australia, the US and Singapore. The summit was aimed at strengthening ties between the international investment community and Russian businesses, as well as federal, regional and local authorities. The CEO of British multinational oil and gas company BP, Robert Dudley, told Radio Sputnik why he took part in the forum for the second year in a row. “If you look at the growth rates in energy, the world will need 35 percent more energy by 2035,” Dudley told Sputnik. “More than a half of the growth rates in energy will come in Asia, China in particular,” he forecasted. Robert Dudley also noted that Brexit has no impact on the company. People will need oil and gas for many years to come, BP’s CEO added. He also suggested that clean burning fuels, such as natural gas should become the fuel of choice for generating electricity in many countries. “While renewables are a good thing and lots of people are investing in it, actually people are going to need oil and gas for many-many years to come, particularly clean burning fuels such as natural gas. And I think what you will see is more of a displacement of coal for natural gas going forward,” he said. Summing up the results of the Forum, Russia’s Deputy Prime Minister and Presidential Plenipotentiary Envoy to the Far East Yury Trutnev told journalists that a total of 201 agreements valued at more than RUB 1.63 trillion ($25bln) were signed at the forum. “The second Eastern Economic Forum showed that it was much-in-demand. We see that business has a desire to come here and this livens up the business environment. So the forum is being held in the right place at the right time. As a result, new projects and enterprises will emerge in the Far East,” Trutnev noted. All the presentations given at the forum by Russian and foreign businessmen indicated that the new development mechanisms for the Far East are working, he said. “We definitely won’t stop with the package of proposals and laws for the Far East that were presented at the forum. There is an understanding that the third Eastern Economic Forum should be different, so new development mechanisms will certainly appear next year,” the deputy prime minister said. “The Eastern Economic Forum is being held in order for the Far East to develop more rapidly. If you look at the growth rates, the number of new investment projects and the inflow of investment to the region, you could say that this process has begun. But there is an understanding that this is only the start of the journey. We hope that in two to three years the system will get going and become comprehensive and competitive. We understand that the region is above all being developed by people who are establishing new enterprises here. For them to keep doing this, they need to know that the Far East is developing and that it is truly better to work here,” Trutnev said in a statement posted on the Forum’s official website.